This is a Pre-Order item and will ship 5-8 weeks from placing order. DIGit Tape is a finger puppet that stretches, covers and sticks to the thumb and other digits for hours of interactive play to help you kick your thumb sucking and nail biting habit. Safe, comfortable, flexible, breathable, hypoallergenic, latex free, water resistant, convenient and budget friendly. For ages 4 years and up. Image will last up to 8 hours with normal wear. "The DIGit Tape is flexible and comfortable to wear. could last hours under typical wear and tear without rubbing off. The cartoon designs are fun and engaging and can be used for a multiple of reasons including: thumb sucking, finger nail biting, picking of your fingers, and as part of story retell as needed..."
"I love, love, love that I now have a great physical reminder for my digit sucking clients that is fun, flexible and stays put! 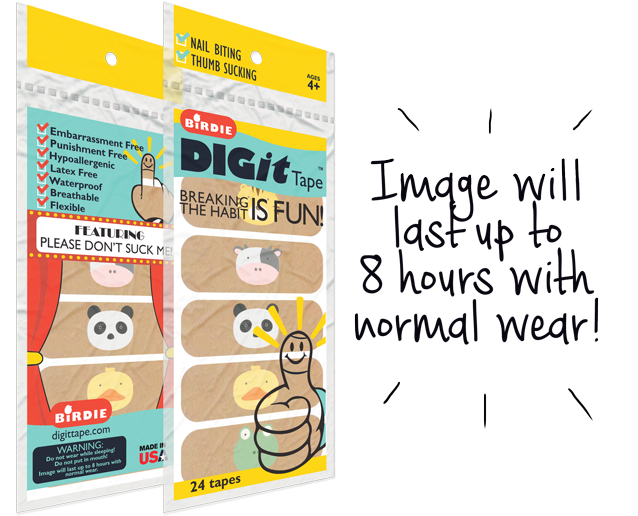 I recommend Digit Tape to my clients as an essential component of my personal comprehensive habit program. Every child deserves to succeed. Digit Tape is a positive and whimsical tool that is part of this process." Shari Green, COM, RDH (Ret.) 2015 President IAOM aka “The Thumblady” For more information, consult your pediatric dentist or pediatrician. Ms. Green’s Oral Habit elimination program is available by Skype or Facetime. "We're having fun with @BIRDIE_SMART DIGit Tape! Using finger puppets to work on language goals: Pretend play, conversational turn taking, following directions... The possibilities are endless!" "As Orofacial Myology Therapists and IAOM instructors, we are always looking for the best product for our digit suckers. This tape has that special "feel" that provides both emotional and proprioception support to our patients."